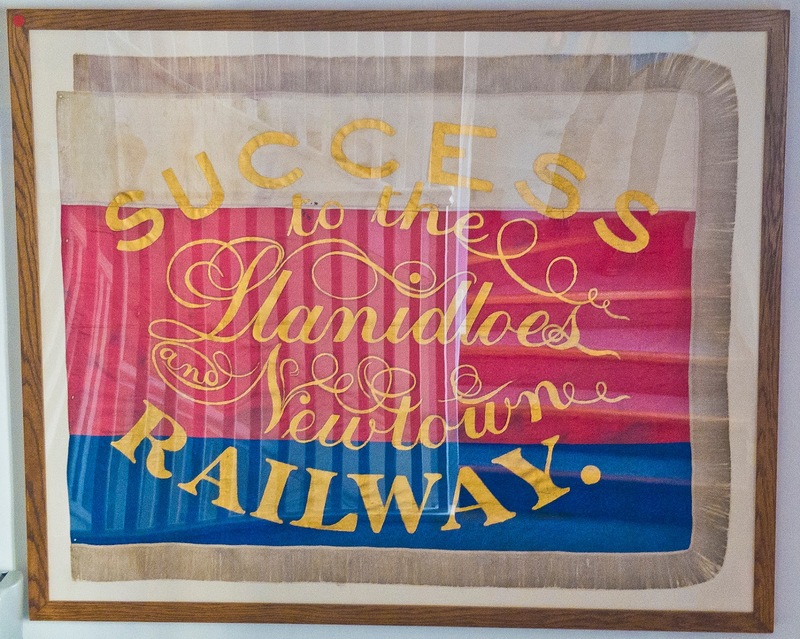 On a tour around Newtown Textile Museum a few weeks ago I noticed this rather nice applique banner celebrating the Llanidloes to Newtown railway, now defunct. 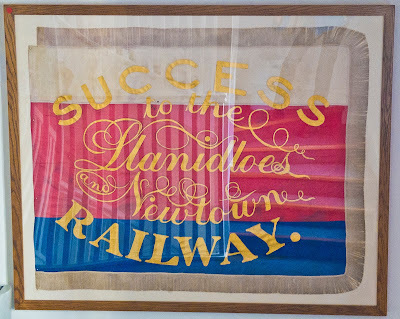 Last week, talking to local historian David Pugh, I heard a bit of the story behind the arrival of the railway in Newtown. It was designed to be cooperative with the canal originally. It arrived on the outskirts of Newtown, from where the goods wagons had to be uncoupled from the engine and towed by horsepower past the paddocks to the canal terminus on the other side of town, so that the sound of the train wouldn't frighten the townspeople's horses. I love the idea that the new high speed rail transport was still in thrall to the needs of the beasts of burden at that point. And canal transport, of course, was completely reliant on horses. Those paddocks close to the town centre have long since been built upon, as has the canal terminus, but the character of the area survives in its layout and architecture. And the canal survives. 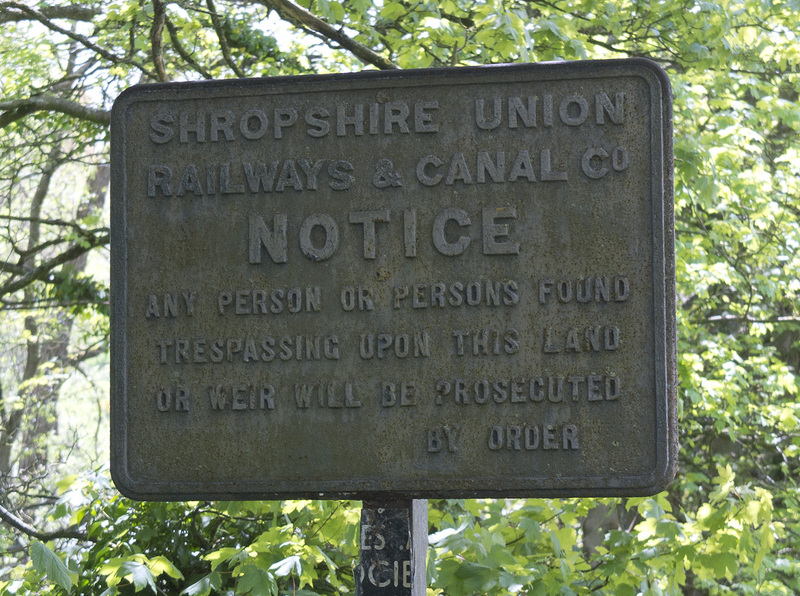 Which is what makes me think there should be a banner for the canal now - a reply to the railway one that acknowledges its continued life and existence. Shropshire Union Canal signage - Authoritative! 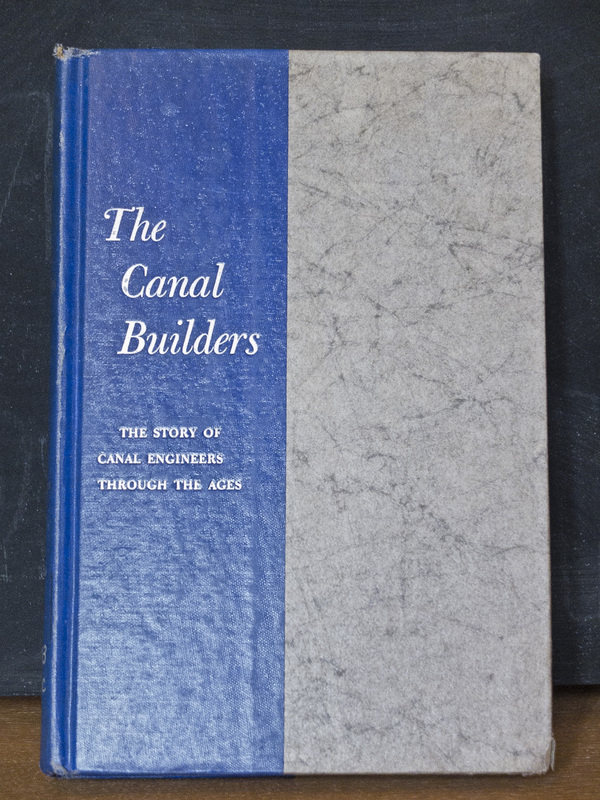 An old book I am delighted to have come across during my canal-oriented musings is 'The Canal Builders' by Robert Payne. It is very much of it's time (1950s), and with a mythical, storytelling tone it takes you across continents and civilisations; Greece, Egypt, Ancient Rome, to wherever man has cut channels to control water. In Rome if you were in charge of hydraulic engineering you were a 'Curator Aquarum' - a fine job title by any standards, particularly today's, when being a curator is so in vogue. Canal-building projects were accompanied by a high level of pomp and ceremony. The emperor Claudius chose to celebrate the opening of a canal off Lake Fucinas by staging a naval battle on the lake. Unfortunately the canal itself was a flop, with barely any water able to flow through the channel. At the beginning of work of the Corinth canal, the emperor Nero was handed a ceremonial golden spade to cut the first sod. However, to the consternation of onlookers, the entry of his spade in the earth caused a red, blood-like liquid to trickle out. Perhaps it was a bad omen, as upon his death the canal was unfinished at only 1/4 mile in length. There are many more epic tales of thwarted and triumphant canals in the book. It reminded me a bit of reading 'The Monkey's Wrench' by Primo Levi. Its tales suggest there is a supernatural side to engineering, an element of the unknown despite the best calculations, especially when you are digging down in to the earth. It also put the restoration of the Montgomery canal in to context for me. It is not uncommon that abandoned waterways should be revived, even after much longer timespans; hundreds of years rather than decades. After all a canal is never permanent without maintenance. Sedimentation sees to that. The existence of a man-made waterway always hangs in the balance of an equation; the reasons for giving the water a way just need to outweigh those for letting the earth slowly reclaim its place.